Ah, spring. That time when a dog lover’s fancy turns to long walks with his best friend and dog trainers phones start ringing off the hook. A long winter can wreak havoc on a dog’s leash manners, so now is a good time to do a little refresher training to ensure that both you and your dog enjoy walking together. Here are a few simple tips for brushing up on your dog’s manners. Dogs get into all kinds of trouble when they expect to greet every persons and dog that they meet. Dogs who see a walk down the street as a social affair also tend to be dogs that pull on leash, dogs that jump on people, and dogs that ignore their owners. In extreme cases, dogs who are magnetized to strange people can become so frustrated by their inability to get to those people or dogs that they develop leash aggression. We teach a specialty class for leash aggressive dogs at Training Tracks and it’s never busier than in the first few warm days of spring. One simple technique can prevent your dog from becoming magnetized, decrease pulling, and stop jumping on strangers. With the “park-it” command we teach our dogs to sit at our side, look at us, and wait for permission to say hello to people and dogs we meet. The best part is that it takes very little focus or effort from you. As you approach someone, simply tell your dog “park it,” and step on your leash to take away the option to run up to people and jump all over them. Next, have your dog sit and treat him while he holds the sit. Once he calms down, you can tell him to “say hi” if and when you wish. Walking your dog should be a cooperative endeavor, not an endurance event where your dog pulls you down the street and you do your best to hold on. Your dog should keep the leash loose instead of pulling and check in with you regularly as you enjoy your walk together. The biggest barrier to a nice relaxing walks is a dog’s opposition reflex. Dogs are hard-wired so that when we pull them one way, they fight it and pull the other. When your dog drags down you down the street with a taut leash, this reflex gets stronger and stronger. Polite leash walking start with reprogramming that reflex. 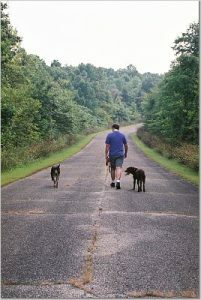 The early exercises for teaching loose leash walking are boring and repetitive, but they work. Find a place with few distractions (like your driveway), mark out a straight line about 30 – 50 feet long, and walk back and forth in a straight line. Whenever your dog hits the end of the leash, use a cue like “uh-oh” and do a 180 degree turn and resume walking in the opposite direction. This teaches that dog that when he hits the end of the leash that pulling isn’t an option. Instead, he should check in to see what you are doing and adjust his pace to yours. It doesn’t take long for most dogs to figure out that paying attention to you makes walks more fun. 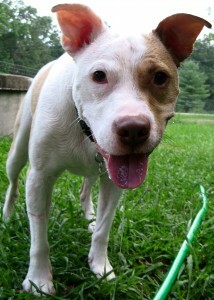 You can see one of our board and train dogs, Indy, get his very first lesson to stop pulling on leash here. Indy pulled Lindsay down the street like a maniac on his way to this first session, but you can see that he starts paying attention pretty quickly. Note that we are in the middle of the blacktop driveway far away from distractions to make it easy. It takes a couple of weeks of this repetitive back and forth training to train your dog not to pull at all, but it’s worth it. Walking with a dog who doesn’t pull on leash and pays attention to you is safer and a lot more fun. 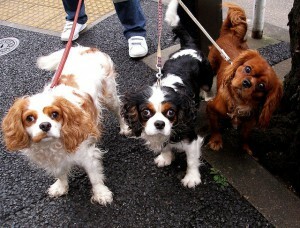 Ask any dog trainer, and they’ll tell you not to introduce your dog to strange dogs on leash. Meeting on leash causes all kinds of problems. 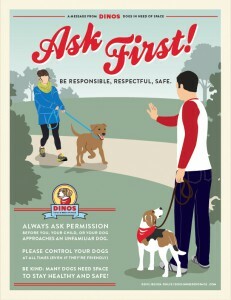 For starters, when a leashed dog feels threatened or afraid, he doesn’t have the option to run away from another dog. Fight or flight no longer applies. If the dog feels that he must protect himself, aggression is his only option. Another big problem with on leash meeting is that dogs who haven’t been taught to “park it” and have become magnetized to strange dogs are often frustrated and behave rudely when they finally approach another dog. Finally, if you don’t know someone, you can’t trust their word that their dog isn’t aggressive. Some people are in denial, some dogs are just developing aggressive behavior (this is particularly common in the spring with dogs who haven’t been for walks in a couple of months), and some people will lie. I’m going to repeat my advice. Don’t let your dog meet strange dogs on leash. After 20 years of dog trainer, I have unfortunately learned that this advice very often goes ignored. People introduce strange dogs on leash all the time in spite of trainers’ warnings. If you insist on doing this, take some precautions. Teach your dog to “park it” and have him do so for a a bit before saying hi. When you do let the dogs interact, make sure not to let their leashes become tangled. Did you know that the period of 7-16 weeks of age is crucial to your puppy’s proper development? Extensive socialization during this period may be the most important thing you can do for your puppy! Dogs aren’t born loving and trusting people. They learn it. Most adult animals are naturally suspicious of anything unfamiliar. Young animals, however, have a period of openness and curiosity as they how their world works. During this “critical socialization window” puppies learn to accept the sites, sounds, and people in their environment. It’s critically important that they have a wide variety of safe positive experiences with people, sights, sounds, and environments during this time. Why is it so important to socialize my puppy? Balanced Personality: Well-socialized dogs are more comfortable and friendly in different situations. Preventing Aggression: Objects, people, places, and noises a dog is not socialized to can create fear and/or aggression. Dogs isolated during the optimal socialization period will encounter many new things as adults that can cause behavior problems. While people offer a wide variety of explanations for the behavior of dogs that are fearful or aggressive, the vast majority are simply under-socialized. Quality Healthcare: Poorly socialized dogs can be difficult (even dangerous) to handle. Regardless of your veterinarian’s skills, it is difficult to deliver optimal care to a fearful or aggressive dog. No Do-Overs: The optimal socialization window begins closing quickly. Dogs can still be socialized afterwards, but it requires much more work. You cannot procrastinate with socialization! What does good socialization look like? Saftey First: Until your puppy is fully vaccinated, it’s safest to avoid areas that might be frequented by unvaccinated dogs. Dog parks or even parks with lots of people walking their dogs are out. Shopping centers are great, but avoid those with pet related businesses. People: Expose your puppy to people of all ages, shapes, sizes, and races. Anything that makes a person move differently (bikes, roller blades, wheel chairs, crutches, a limp, etc.) is good for your puppy to encounter. So is anything that makes a face look different (hats, hoods, sunglasses, scarves, etc.) 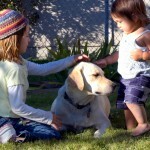 Toddlers and elderly people are particularly important for puppies to encounter if they aren’t part of your daily life. Sounds: Expose your puppy to a wide varity of sounds like traffic, heavy machinery, the vacuum, grocery carts, etc. Surfaces: Teach your puppy to climb on things and make sure that they have good experiences with grass, gravel, wood, conrete, the table at the vet’s office, etc. Let Your Puppy Set the Pace: Never force or even coax your puppy to approach something when he doesn’t want to. He’ll overcome his shyness much more quickly if he can approach on his own terms. Manners Matter: While it’s good for your puppy to meet a large number of people, it’s also important for him to learn to ignore people and other dogs. We don’t want puppies being magnetized to every person and dog that they see in public. When you’re out in public, your puppy should be focused on you most of the time and ignoring most people. You should keep your pup close to you when first encountering new people and only let them say hello with persmission. Food Bowl Exercises: Dogs don’t generally share food and bones, and food guarding is the most common kind of aggression that most dog trainers see. If we start before they are 16 weeks old, however, we can teach them to love giving things up to us. Handling and grooming: Puppies usually love being picked up and cuddled, but adult dogs naturally do not. Proper socialization will teach a puppy to allow handling for veterinary care, grooming, or whenever you need it. 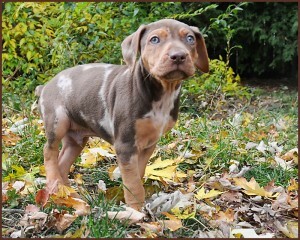 Easy resolution of problems: Genetic predispositions can contribute to a variety of serious behavior problems, but we can often solve these problems easily if we can catch the warning signs in a young puppy. By 5 or 6 months of age, problems like aggression, separation anxiety, and shyness can already take several times as long to address as it would for a puppy under 16 weeks. One of the trickiest questions that I get from my dog training clients has little to do with dog training, but people are asking me more and more often: “When should I spay or neuter my dog?” My answer generally boils down to “It’s complicated. Talk to your vet. Do some research.” It’s not just a coincidence that more and more people are asking this question. Recent research into the health effects of early spay neuter has reopened debate about the long-standing consensus in favor of early spay/neuter among animal professionals in the US. Some of these studies suggest that early spay and neuter can have a variety of negative impacts on our dogs’ health, but the issue is far from settled. As a dog trainer, I’m reluctant to answer these questions for my clients. I’m not a vet, and I have no special expertise on health matters. Fortunately, I now have somewhere to send all of you who have asked me about this. Dr. Patricia McConnell has tackled the subject on her blog. I couldn’t be happier about that. Trisha has an unparalleled ability to present complicated scientific questions in an entertaining and accessible manner without sacrificing detail or complexity. Whether you want to dig into the details of the studies informing this renewed debate or just read a good summary from one of the smartest people in dogdom, check out this article for both links and analysis. As with any health issues, discuss when you should spay or neuter your dog with your vet. I’m a huge advocate of pet owners making informed decisions for their pets. I spend a lot of time educating myself, but – in the end – I don’t have the training necessary to put everything that I read into perspective or to understand how it might apply to my individual dog. I rely on my vet to do that for me. I will only take my pets to a vet who keeps up with developments in the field and is willing to explain my pets’ health issues and options to my satisfaction. I do research so that I can ask the right questions and understand the answers, but I ultimately rely on the the trained professional who knows my dog to help me make the right decisions. Why does my dog ignore me?Does your dog ignore you when you call him to come or give him a command? 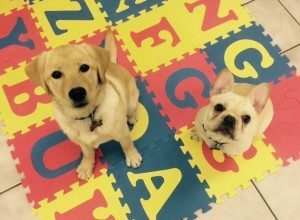 “Why does my dog ignore me?” is one of the most common questions I hear from week 1 students in my dog obedience training classes. Some of them take being ignored as a challenge to their authority. Others get their feelings hurt and worry that their dog doesn’t love them. In reality, most people whose dogs ignore them have unwittingly trained them to do so. Dog training comes down to one simple principle: The behavior that is rewarded gets repeated. Set your dog’s life up so that behavior you want leads to Good Things for Dogs and behavior you don’t want doesn’t, and you will have a well-behaved dog. Simple, right? It can be, but first you have to understand how to make your dog connect rewards with the right behavior. To do that, you must understand 3 key differences between our brains and dogs’ brains. Your dog thinks you talk too much. Trust me. He does. Friends and family may hang on your every word, but not your dog. Dogs have their own natural “language,”, but it doesn’t have words. Dog language is visual. They communicate volumes with their posture, their tails, their eyes, and their ears. For this reason, their first instinct when trying to figure out what we want is to watch us; not to listen to us. Our constant talking is just noise to them. Try following this simple rule. If you tell your dog to do something 5 times and he doesn’t do it 4 of those times, stop telling him to do it. 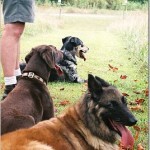 Training happens every time we interact with our dogs, whether we notice it or not. If you keep calling your dog or telling him to get off the counter and he doesn’t listen, then you are actively training him to ignore you. We need to make our words count in dog training. So what do you do if you can’t repeat a command to a dog who is ignoring you? You change your focus, which leads to our second big difference between how dogs and humans experience the world. Learn more. When we get hung up on what we can do or say to prompt our dogs to behave, we have it backwards. Remember the first principle of dog training? The behavior that is rewarded gets repeated. The consequences of a dog’s behavior determine how much of that behavior we’ll see in the future. If good things tend to follow a behavior, a dog will do more of it. If they don’t, he’ll do less of it. We create motivation by controlling what follows behavior. Once we motivate a dog to do something, putting it on cue is the easy part. Proximity in time matters almost as much as order. Dogs are truly creatures of the moment. Our own brains stay busy analyzing past events and contemplating the future. Not our dogs. They live completely in the now. To communicate effectively with them, we must learn to do the same. Our feedback on their behavior must always be about what they are doing RIGHT NOW. When your dog does something, you have about 2 seconds to weigh in on it, and that’s if you’re lucky. If, for example, your dog sits when you ask him to, but then jumps up on you before you’ve had a chance to deliver a reward, you’ve lost your chance. The hardest time to follow the rule that our feedback must always be about the dog is doing right now is when our dogs make us angry. When you displease us, we humans want to tell you about it … and tell you about it … and then make sure you really understand. A dog’s reprimands, on the other hand, stop when the offending behavior stops. If you want to make sense to your dog, you must learn to change direction on a dime. If your dog strands you at the dog park for an extra hour by refusing to come when called, for example, you’re going to be really frustrated. No matter how angry you are, you must praise and reward that dog when he finally comes. Because he associates your behavior with what he is doing right now, scolding will only make him less likely to come next time. I only ban one phrase in my dog training classes, “He knows this. He does it at home.” People are almost always wrong when they say this. It’s a natural thing to assume. If my dog lies down whenever I ask him to at home, but won’t do it in class, then he must be ignoring me or challenging my authority, right? Wrong. Humans excel at abstraction and generalization. The gift of language allows us to effortlessly understand that the word “sit” applies to planting our rear ends on the ground, on the couch, on a bar stool, etc. Dogs don’t think that way. For them, everything is context specific. Just because that funny “sit” sound that you make predicts Good Things for Dogs who plant their butts at home doesn’t mean that it applies in other venues. When our dogs fail to comply with commands in new situations, it’s not defiance. They honestly don’t get it. I prefer to think of mistakes as questions. Do I have to sit when you make that noise in class? What about when the doorbell rings? What about when…Squirrel!!! For this reason, I also like to think of training as more like exercise than like teaching commands. In weight lifting, you start with a weight that’s a bit of a struggle and lift it repeatedly until it’s easy. Then you add more weight. In dog training, we break our ultimate goal down into little pieces, start with something slightly challenging, and do repetitions until it’s easy. Then we make it a little harder. Asking my dog to sit when we’re alone in the kitchen is like asking him to lift 5 pounds. Asking him to sit when the pizza delivery guy rings the doorbell, gets everyone barking, and stands outside smelling amazing is like asking him to lift 500 pounds. You don’t get from 5 pounds to 500 pounds overnight. You have to do lots of repetitions at ever-increasing levels of difficulty to get there. You’ll learn numerous training techniques in obedience class, but you will apply them more effectively if you remember 3 things: every word counts, timing is everything, and it all depends (on the context). Happy training! Now that the weather is finally nice, dogs are enjoying lots of outings with their owners. And they’re all so adorable – it’s human nature to want to pet and interact with each and every one of them :-). However, some dogs are bashful and need some time to feel comfortable before allowing you to touch them, and others might not want to be petted by strangers. What’s the best way to ensure a safe, fun interaction for all involved, and what are some signs that the dog might not appreciate the attention? Here are some tips on How to Greet A Dog! 1) First, ASK the owner and WAIT to hear the complete answer. Ask from a distance (in case the dog is scared of strangers), and WAIT to hear the answer before charging up. Often, people just assume the answer will be yes, and the question is just asked “because that’s what you should do to be polite”. Give the owner time to answer first. The answer may be “yes”, but it might also be “yes, but …” Wait to hear what’s on the other side of the “but”. The dog may have to sit to earn the opportunity to greet, or there may be other rules attached (such as “don’t pet her if she jumps”). Or, there may be other important instructions from the owner (such as “please let her approach you – it might take her a moment or two”, or “please pet her under the chin, not over the head”). For example, if you see Mel uptown with a board-and-train dog, she will likely say, “yes, but… he has to sit first, and be released to go say hi”. We have noticed that most people only hear the “yes”, and as she is trying to get the dog to sit, the person charges up and starts petting. It’s a frustrating situation for the person trying to train the dog, and confusing for the dog who is trying to learn the rules. 2) If the owner says yes, then ASK the dog. Be polite – the dog will be much more likely to want to interact with you. Rule 1: Do not stick your hand in a dog’s face so he can sniff you. He could smell you long before you got that close. Sticking your hand out can be considered a threatening gesture for a fearful dog, and it’s just not necessary. Everybody does it, but dogs do not appreciate it. And we’ve seen people get bitten that way. Instead, stand where you are, with your hands at your side, and let the dog come to you. Rule 2: If the dog does not come to you, accept that. Instead, talk to the owner about her dog. Ask his name, what his breed is, or what his favorite activity is. Perhaps with some time the dog will approach you, but if he doesn’t, he is giving you useful information – he is telling you he is not interested in interacting right now. Be polite, respect the dog’s desire for distance, and don’t push the issue. Rule 3: Pay attention to the dog’s body language. Learn to read canine communication — their body language will tell you if they are comfortable or not. Signs of stress can include tongue flicks, yawning, and turning away. Also, be aware that a wagging tail does not always indicate friendliness. Here is a great video on canine body language — watch it and learn how to read what dogs are telling you! 3) If the owner says no, please respect that. The dog may be shy and learning to be comfortable in public, and trying to pet the dog might scare him and set back his behavior modification program. The dog may be a service dog doing his job, or a service dog in training, and should not be distracted. The dog may be in training, learning to ignore the distractions around him (including friendly strangers). The dog may not feel well, and may not be in the mood for interactions with strangers. The dog may be tolerant of touching by strangers, but might simply not enjoy it. 4) When the dog approaches you, pet him on the chin or chest – not on top of the head. 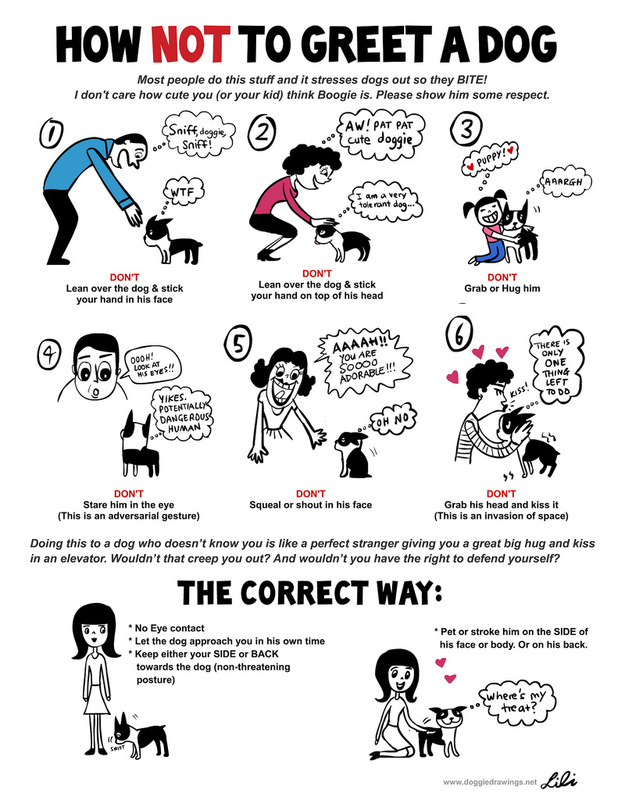 Use proper dog-greeting etiquette! Most dogs aren’t comfortable with hands reaching over their heads. It’s the way humans tend to pet, but it’s not the way dogs would prefer to be petted. If you do it anyway because you forgot and the dog pulls his head away, don’t do it again – instead, try reaching under the chin and then working around towards the ears or to the chest. Also, don’t loom over the dog – they can find that scary. Bend at the knees, not at the waist. 5) Follow the 5-second rule. Pet the dog for 5 seconds, and then stop. WAIT and see if he asks for more. If not – respect that. Some dogs want only a small amount of touching from strangers, and then they’re done – if they retreat, they’re telling you they don’t want more petting at the moment. Don’t walk after the dog to pet him more – wait until he approaches you again. If he does not, see #2 above. They can also be a tremendous waste of money. These 5 questions can help you choose a dog board and train program that delivers great results. Is the dog trainer right for you? Becoming a dog trainer requires no license or special degree. Anyone can hang out a shingle, so do your homework. Interview at least 3 trainers. No single criterion guarantees a dog trainer’s skill, but look for trainers who have proven themselves against an objective standard. Start your search with trainers certified by independent bodies like the IAABC or CCPDT. Membership in professional organizations like the APDT and titling dogs in competition also demonstrate commitment to the craft. A trainer’s ability to work with you is at least as important as his skill with dogs. You should feel comfortable with your trainer’s communication style, training methods, and background. Spend some time thinking about your training goals and whether the trainer can meet them. Is his background in training family pets or working dogs? How often does he work with dogs and families with issues like yours? Does the training involve the use tools or methods that you might find too rough? Read more on choosing a trainer from APDT. Does the board and train program match your lifestyle? A good dog board and train program starts with well-defined goals. The trainer should spend some time learning about your dog and your family and then provide you a custom written training agreement. If the trainer seems to have a “one-size-fits-all” approach, seems impatient with your questions, or fails to provide a written agreement find someone else. Make sure that your dog will learn how to behave in his actual environment. When trainers take dogs into their own homes, they can easily integrate dogs into their daily lives so that they constantly practice the skills they need at home. Some kennel-based programs have brilliant strategies for simulating real life scenarios and will be thrilled to explain them to you. Others drill commands in a single training room. The latter programs seldom teach the skills dogs need to be good family members. Does the trainer train you? This is the most important question you can ask when choosing a dog board and train program. You and your dog both need training. Training a dog is not an event. It’s a process that requires life-long practice. Many trainers promise to send your dog home trained for life; no work required on your part. It sounds too good to be true, and it is. Dog training doesn’t work that way. Training happens every time you interact with your dog. Programs that promise otherwise are dog training’s equivalent of the “skinny pills” sold on late night TV that promise massive weight loss without diet or exercise changes. I like to think of it like dancing. Prior to our wedding, my wife and I took a dance class so that we could impress on the dance floor. We found that when either of us made a mistake learning a new step, we both got completely stuck. The instructors, however, could grab either of us and teach us the steps instantly. They saw our mistakes coming and could effortlessly guide us into avoiding them. Dog training works the same way. In obedience class, neither the dog nor the handler has any idea what to do. Even when one partner gets it right, the other’s mistake can confuse you both. A good trainer can teach your dog behaviors much more quickly than you can. Your dog, to continue our dance analogy, comes home from board and train knowing all the steps. To make the training last, you – his partner – must know both the steps and how to lead. You get the advantage of learning with a skilled partner, but you still need to learn. Successful board and train programs provide that follow-up instruction. Is the board and train environment right for your dog? Go see the facility. Make sure that your dog will be well cared for. Reputable trainers will welcome you to see where your dog will stay. Many facilities have set times for tours or require appointments to accommodate busy training schedules, so ask in advance. Things to look for and ask about include sanitation, fencing security, ventilation, and quality of sleeping areas. For kennel-based programs, make sure that they are properly licensed and follow industry best practices. In both home and kennel-based programs, dogs should have comfortable places to sleep. They should get at least an hour a day of exercise other than training. They should be outside of a kennel or crate environment at least 6 hours each day. Play with other dogs should be closely supervised. There should be staff on the premises to watch over the dogs overnight. This is a tricky question. As discussed above, your consistent enforcement of your dog’s new rules will have a tremendous impact on his behavior. For that reason, the codes of conduct of the premier animal behavior professional and certifying organizations – the APDT, IAABC and the CCPDT– actually prohibit guaranteeing specific long term results from training. Good trainers stand behind their work in ways that acknowledge the fluid nature of dog behavior. They have a process to back up their promises. In our dog board and train program in Cincinnati, for example, the entire process is structured around a written agreement that spells out training goals. We promise to meet those goals and keep owners updated on our progress. When the dog goes home, we go with him and make sure that he can perform as well in his home as he did in ours. We come back twice more in the next few weeks to make sure the training sticks for both dogs and humans. If a dog cannot perform what we promised, we do more training until we get it right. If a trainer’s guarantee sounds too good to be true, it probably is. The most ambitious guarantees often come from the “skinny pill” trainers discussed above. Make sure that you understand exactly how your trainer handles problems. Ask for examples. If he says that it never happens or can’t give you an example, his “guarantee” may be an empty promise. We needed personalized, in-home training for our 2 female dogs who fought with each other and who needed to be prepared for the arrival of a baby. We got help with these issues and so much more. Through the patience and knowledge of Training Tracks’ trainers, our girls are now well behaved and play happily as ‘sisters’. And, not only did we receive in-house visits, Training Tracks was available by phone for questions in between training sessions. Thank you for changing all of our lives!